I was sent by the Orange County Register to shoot snapshots of the crowd at the 11th Annual Doheny Blues Festival in Dana Point. I went last Saturday, the 17th, and was really surprised by how many people attended. I have my press pass and so after some checking I got in and went to work. The best part of the whole thing was just seeing everyone getting along and having a good time. I like all types of music and although I wouldn’t pay to get into any venue just to listen to the music like at Doheny, I could appreciate the fact that there is good reason to do it if you are into it. There was the usual parade of drunks and those folks that seem to be always out to over ambitiously dress and call attention to themselves but, all in all it was really laid back. I had been thinking that I was not going to get assigned the shoot and had applied for an independent press pass which the event company never got back to me about. After seeing the routine, I could see why; they had their hands full and although it wasn’t poorly organized there were some shaggy parts here and there. I think trying your best counts for a lot and they really tried to pull it off and I think it was a success and getting better every year. When ever I go on a shoot I really concentrate and so I was not paying too much attention to the music. Mostly looking through the crowd from the point of view of the performer, I shot people, couples and kids enjoying the music. 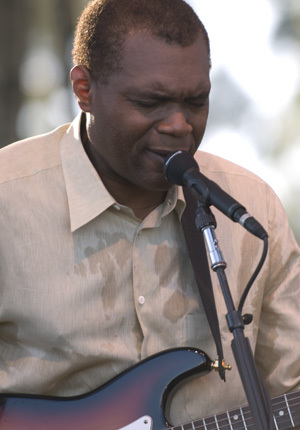 When I was done, I sat checking my images to make sure I had my shots and was able to listen to Robert Cray a little bit. I had never heard of him and really only remember him now as I had to include his name in a photo caption that I sent in. He has a great voice with tremendous emotion, in addition to playing the guitar really well. I think, as he sang the words to his songs, he really meant it and the crowd was into it as well. At one point his guitar failed and it seems the audio in general did as well. He just kept on going, doing his thing; the mark of a true professional. The roadie brought out a new one; he smiled, acknowledged the crowd with a shy smile and continued on as if he was in his own backyard playing just for himself. I ended up at his website the other day to see if I could find out anymore about him and after looking at his schedule, decided there was nothing more to see. He is busy all the time and just goes from one gig to another. I wondered what that must be like and what he is like when he takes a break. Just another job I guess.